Players sick of their joystick shaft jutting out from their backpack or messenger bag can rejoice! The Link by SRK's PhreakMods is a fantastic new 2-piece JLF shaft design; once installed, removing or attaching the protruding joystick shaft with balltop or battop is incredibly simple and hassle-free. The Link comes with a spring-loaded top piece, a bottom shaft piece for install into the joystick housing, and a MadCatz TE-compatible hex key for easy tightening of your accessory balltop or battop. To use, simply pull up on the spring-loaded top piece with your thumb and forefingers, then pull off. To reattach, again pull on the spring-loaded top piece; while holding this in place, rest it on the bottom piece, and release the top piece. The Link is made of stainless steel, and ball-bearings inside the top piece make it incredibly sturdy during heated gameplay. Let's face it: traveling with a joystick isn't easy. For those with who travel to tournaments, you're aware of the looks and occasional spot check by airport security because you can't place your joystick in a typical messenger or book bag. The Link is ideal for the casual players looking to save some space, and for traveling tournament players who need to cram as much into their bags as possible. For those who like to share their joystick with fellow players, you no longer have to worry if your friend wants to use their favorite battop or balltop. It's very easy to attach their JLF link attachment to your joystick, or to carry around a spare balltop or battop for them to use. Finally, The Link also features a hollow shaft. This feature makes this joystick accessory a fine choice for LED balltop projects! Please refer to the YouTube video produced by SRK's Vivovicko for a very helpful install guide for most joysticks that use a Sanwa JLF. You'll find it in our Product Videos section on this page. Several players on Shoryuken.com have shared their photos of the JLF Link in their attractive custom and modded joystick cases. Please see our photo gallery for a taste of what how slick the JLF link will look in your custom joystick design. Please lubricate your JLF Link prior to use. Dustwasher for JLF-TP-8YT will not fit the Link. JLF-CD series shaft cover will not fit the Link. JLF series dustwasher will fit snug on the Link. FA Nippon ALU series dustwasher will not fit without modification. Sanwa JLF-TP-8YT Joystick, balltop or battop is not included with purchase of JLF Link. Take a small bit of the FA.DAB .20 Ounce Shin-Etsu Silicone Grease on your finger tip and spin the link base to apply it in a thin coat (from underneath the tapered head down to the e-clip), it's easiest to hold the tip of the base between your other hand's fingers and just spin it. You only need a thin coat, just enough to basically make the piece look "wet." Re-assemble, making sure there's also a thin layer of grease on the pivot bushing as well for good upkeep measure. Phreakmods is providing us with a helpful video to illustrate the procedure. Stay tuned. Some JLF series joysticks have a inner dustcover that rests underneath the control panel, right over the pivot bushing. 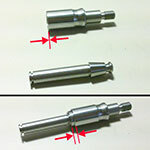 This is prevalent in the MadCatz® TE/SE and QanBa® brand joysticks. Removing that insert from your JLF will ensure normal operation of The Link in your joystick case. A descriptive guide explaining this is provided with every JLF Link purchase. Custom plexi dustwashers may have an adverse affect. If you find it's popping out during play and you have a custom dust washer. Remove said dustwasher and test the compared performance, you should see an improvement. A workaround to this is to put a counter-sink into the inner-diameter of that dustwasher, as it will alleviate problematic pressure on the collar of the Link from that hard angle. When connecting the JLF Link's upper and lower pieces, you may notice a very slight space when attempting to lower the upper piece into the buttom pieces. Please note that the space is normal, as the upper piece is accomodating the lower piece snugly. There is no affect on its functionality. The photo diagram at right - taken by SRK's FreedomGundam - shows how the pieces appear when disconnected (top), and later connected (bottom). You can view this diagram in the product photo gallery. Yes, that's normal operation for now. The collar won't go "all" the way down, it will stop a mm or two short. It shouldn't ever come off while playing though. Future iterations will more than likely change that and it will go down further.. for now it should operate just fine even though it doesn't not. Full excerpt and details are available in the official JLF Link forum thread on shoryuken.com. I bought the quick release JLF in order to make it easier to transport my Qanba Obsidian. Installation was very, very easy. I have zero experience modding a stick but I was able to install the quick release JLF just going off the tutorial video included on the product page. The one thing I would say, and this is nothing against the product itself, is that for anyone with an Obsidian be sure to order a ball top to go with the quick release JLF. The ball top on the stock Obsidian is fused with the shaft (or at least mine was) so I would have to been stuck if I didn't happen to have another stick sitting around I could steal a ball top from. Usage of the quick release JLF is just as easy as advertised, and still feels very sturdy when everything is attached. In use it feels like and works just like the old stick shaft. I love these. The portability is nice but what I really enjoy from them is the tightness you get from the way everything holds in place.